Alternative title: How to make meal times less frustrating and more enjoyable. There’s been a lot of trial and error over the past 12 years of feeding my kids. I’ve definitely had my fair share of fails but I’ve learned a lot along the way. In particular, I’ve figured out a few ways to challenge picky eaters, how to avoid making multiple meals, how to encourage nutritious food options without it feeling like I’m nagging or micromanaging, how to foster competent eaters who can trust their own intuitive signals, and – most importantly – how to make meal times enjoyable rather than contentious or frustrating (for everyone). First, I would recommend checking out THIS past blogpost about The Division of Responsibility (DOR) in Feeding if you aren’t already familiar. That’s definitely where to start and is a theme throughout all these tips. HERE is the book that the DOR comes from. First, I would strongly encourage you to cultivate a positive environment at mealtimes. Set the expectation that no one will be disrespectful or derogatory about the food or what others choose to eat (or not eat). When someone complains about the meal or says how much they hate this or that, gently remind them of the expectation. Encourage them to be gracious to whoever has prepared the meal, expressing appreciation before and after eating. If they try and don’t like some part of the meal, they can respectfully decline eating it. Honestly, this has changed so much for us, particularly me feeling resentful of how much time I’ve put into planning and preparing a meal to only have them complain or whine. Preparing build-your-own style dinners is probably my biggest secret in feeding kids. If they have complete ownership of how much and what goes on their plate (of what I’ve decided is served), they rarely complain. I do a build-your-own salad bar a lot and they actually look forward to it. It’s a non-threatening way to serve a salad. If I was to prepare a salad and dish it up for them, they would probably lose their minds. Some other ideas: potato bar, taco/burrito bar, build your own pasta and Hawaiian Haystacks. Include your kids in planning meals. This is a great way to educate about balanced meals and meal planning in general (someday they will have to do it on their own!). If my kids have picked a certain entree or side dish or vegetables, they are about 1,000 times more likely to eat and enjoy it. It also helps them know I value their food preferences and input, which makes them more willing to value mine, my husband’s and their siblings’. Have them help you cook. I don’t have time for this every night, but I find if they’ve helped with chopping or assembly – learning about ingredients as we use them – they are much more curious and open to trying what’s been prepared. I actually think this is a secret for adults as well. When you feel connected to your food, the whole experience is more enjoyable for you. Knowing where the food came from and seeing it come together creates an intimacy with food that is deeply nourishing. It’s easy to become disconnected from food which is at least in part why food behaviors are more likely to be disconnected and disordered. Don’t expect them to like everything you prepare. Not all dinners will be winners and they don’t need to be. Your job as a parent is to expose them to a wide variety of foods in a neutral, non-contentious, environment. None of us like ALL foods, and neither will your kids. Give them space to explore and develop their own palate without taking it personally. In order to ensure they don’t go hungry, always serve something familiar at meals that you know they will eat. Don’t let them eat the same foods over and over. My 3 year old could eat PB and J for every meal if I let her. Every once in a while she might have it twice in one day, but it’s totally OK for you to say “that’s not on the menu”. YOU are in charge of what is served, not them. For lunch I’ll often give her a couple of options, which may or may not include PB and J. For dinner, we all eat the same meal. 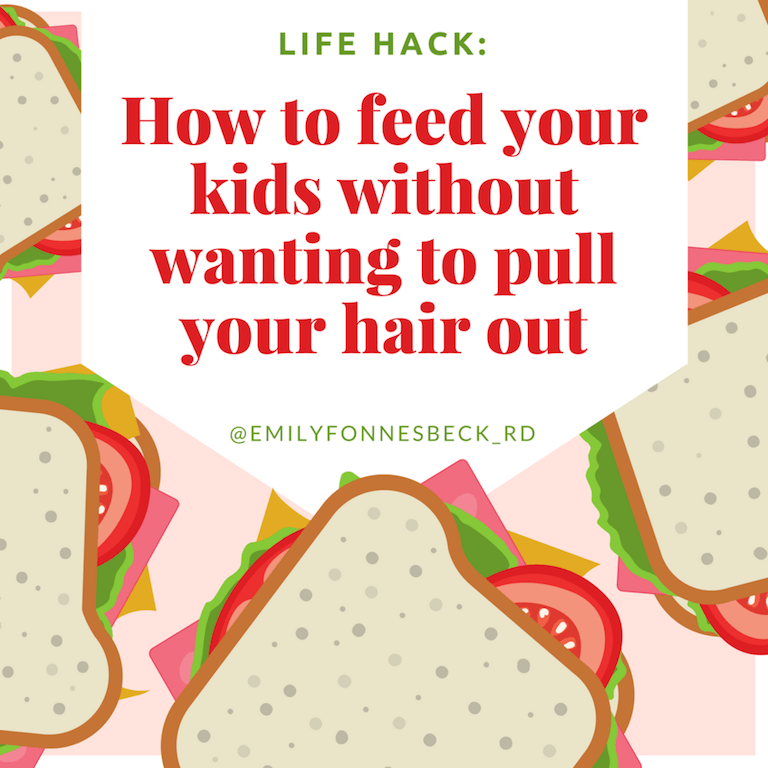 They can decide how much they have, but in order to avoid picky eaters or becoming a short-order cook, I would be sure to not go down that very slippery slope of eating the same things multiple meals in a row. Remember they are kids and are still developing tastes for different foods and textures. There are meals I would totally love to be able to prepare for dinner but I know my kids would never feel comfortable eating them. I respect that. It’s just too much to ask, and that’s OK. I may make those meals for me to eat for lunches throughout the week, but when we all eat together, I prepare something all of us can feel comfortable with. My objective is to create positive experiences with food for my kids. The last thing I want to do is make them feel uncomfortable or forced into something they really dislike or aren’t ready for. Ask them questions instead of telling them what to do. Things like “does your tummy feel full?” or “what could you add to that meal to make it more balanced?” or “what sounds satisfying for lunch?” will be far more effective than “stop eating, you’ve had enough” or “eat this instead” or “that’s not healthy”. The goal is to build competent eaters that can naturally self-moderate their food selections rather than to build super healthy eaters. Less overthinking. If you’re like the moms I know and love, it’s easy to do that. In order to make meal times enjoyable for you too, remember that your kids are in charge of IF they eat and HOW MUCH they choose to eat. Let them have some space to learn about food and how to best meet their own needs. Feel free to guide and teach, but don’t feel like you need to control every food situation…that can make a mom crazy.